I have available the following full pedigree Norwegian Forest cats. 3 . 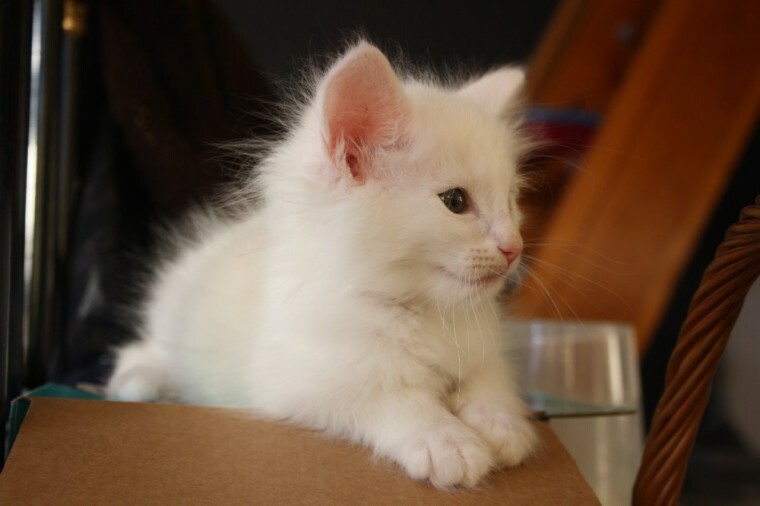 Solid white boys The kittens will be very well socialised before they leave home at 13 week. be litter trained. micro chipped. inoculated. fully vet checked and of course neutered. It goes without saying that we will have been wormed and flee treated. We never leave home without this being done. we will also be registered with FIFe. but as our dad is also registered with GCCF it is very easy to change us over if you think that you would like to parade us in all our furry wonderfulness to the world of showing. A four generation FIFe certified pedigree will be provided. The pictures are not so good today. but slave will change these as we grow. Well sometimes she gets to do that. as normally we all get reserved very quickly. so then its only the new owners that get to see us grow. My babies will be able to go to their new home about third week in December. but I am more than happy to keep the kittens until after the holiday season.